'Knole', the Herman Duryea estate designed by Carrere & Hastings c. 1903 in Old Westbury. 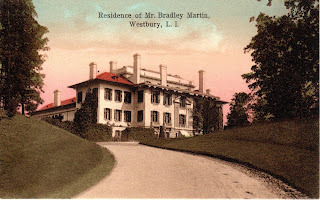 The home was later owned by Bradley Martin and Helen Phipps. Click HERE and HERE for more on 'Knole'. Click HERE to see 'Knole' on google earth and HERE on bing. Just about says it all, doesn't it? 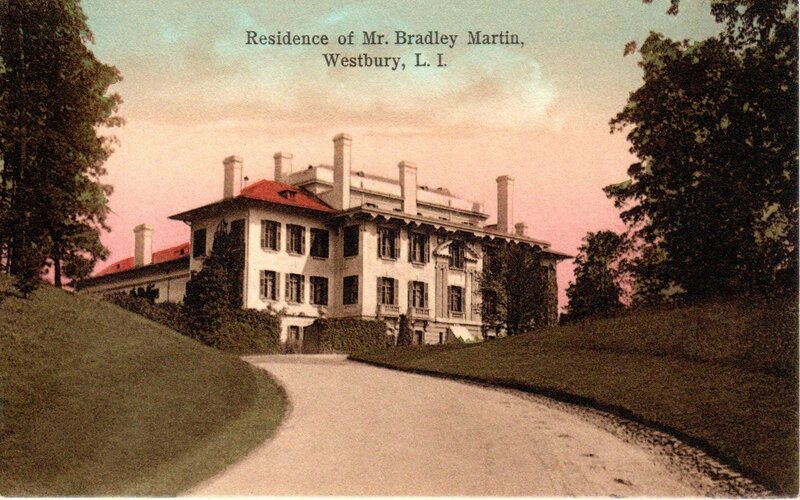 The long curving drive up to the magnificent house..
Who would have been worth more, Bradley or Helen ? The gate would have had to have been removed either way. As in the case with Spring Hill, the entrance needs to be wide enough for modern day emergency vehicles such as fire trucks. Obviously two very different approaches though, at Spring Hill the gate was reinstalled behind the entrance with landscaping whereas at Knole the developer took the gate apart and widened the whole thing before reinstalling it (giving it a sort of Frankenstein look). Not to ruin everyone's day but I just saw the broker's announcement (Massey Knakal-Forest Hills office)that they are selling a "33 acre prime development site-village of North Hills" for $49 million. Doesn't read as particularly oriented towards saving the house. Here's there description of house-"This exquisite 87 room Tudor Elizabethan mansion was originally built in 1920 and features a reflecting pool on the grounds." On a slightly ironic note one of the brokers is named Guthrie Garvin. Whoops-should have been "Their description"
$49M asking in the current economy, even with plum real estate, isn't going to move quickly. Which about the only luck on preservationists side. My point was that they could have left the gates and drive to serve only the main house (and perhaps one other) via an easement (as was done with the Murnane house on Muttontown Road when Serenite Lane was built) and then built the subdivision entrance separately. Developer might have had to give up one lot although even that would be surmountable via a variance. The village creates more problems than it solves. Having incredibly fond memories of OW growing up and now living north of 25A it pains me to see what has happened every time I drive there-particularly I.U Willets. Progress and change are inevitable, bad planning isn't. I hear the Knole mansion itself is being left to ruin. Is that true? Knole was reported to be sold to a religious order however it appears to be abandoned. NSP, The next golden opportunity for OW to screw up is handling Crossroads the Grace family compound. That complex is suitable for a multi-residence mixed use zoning application which OW would frown upon in favor of a standard subdivision thus eliminating the present house and landscape. Anon, do you have the link to the Inisfada listing? I tried to find it and couldn't. Like Gary Lawrance, I too tried to hunt down anything on Inisfada's listing. Most commercial pitched opportunities are fairly easy to track down. Nothing is coming up yet. NSP, where did you see it? Not even on the Massey Knakal site itself. Even though its quite the listing/marketing coup. I'm emailing it to Zach.